Russian Premier League side Amkar Perm have reported via their official website, fc-amkar.org that they will appeal a red card handed to Nigeria international Fegor Ogude in the club's 2-0 loss to Arsenal Tula on March 9. The central midfielder was sent off in the 76th minute, a minute after he came off the bench, and Amkar Perm have asked the Control and Disciplinary Committee of the RFU to cancel the red card when the meeting of the FTC is held on Wednesday, March 14. Referee Mikhail Vilkov admitted that he made an error with the dismissal of Ogude, saying he deserved only a yellow card. ''Unfortunately, I was mistaken in issuing sanctions to Amkar player Ogude. I was close to the incident, but showed a red card,'' said Vilkov to Rossiyskaya Gazeta. 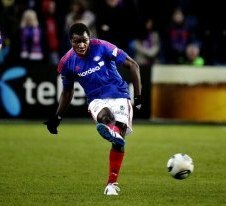 This season, Fegor Ogude has played only nine matches in the Russian topflight from a possible 22 due to a cervical spine injury he had been recovering from. He has been yellow carded only once in those games, against Ural in October 2017.